2016.01.19 Hong Kong – DotAsia announces today the official appointment of Ajitora (http://www.ajitora.asia) as a Tx2 Ambassador. Tx2 is supported by Global Tiger Forum (GTF), WWF, TRAFFIC and other organizations. Wild tiger population dropped 97% from 100,000 just 100 years ago, to as few as 3,200 today. Tx2 is a vision by tiger range countries (China, India, Malaysia, Indonesia, Thailand, Cambodia, Vietnam, Nepal, Laos, Bhutan, Bangladesh, Myanmar and Russia) to #doubletigers in the wild by 2022, the next year of the tiger. Unbeknownst to many is how the Internet directly impacts wildlife environment. Proliferation of illegal wildlife trade online, coupled with abusive mining of social media data for criminal poaching and deforestation activities, threaten the survival of tigers and other wildlife. 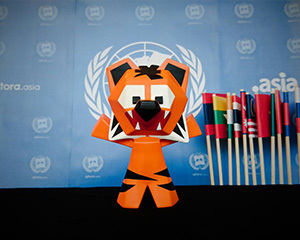 DotAsia is committed to a multi-dimensional campaign from technology, Internet policy, to consumer market engagement to support Ajitora’s new role as a champion for tigers and sustainable development in Asia. DotAsia (https://www.dot.asia) is a registered not-for-profit charitable organization (DotAsia Foundation: IRD 91/12820) with a mandate to promote Internet development and adoption in Asia. DotAsia operates the “.Asia” top-level domain (TLD) as part of the core global Internet infrastructure, and is formed as an open consortium of official domain authorities in Asia, including .CN (China), .JP (Japan), .KR (Korea), .IN (India), .NZ (New Zealand), .PH (Philippines), etc., and regional Internet organizations including APNIC, APNG, APIA, APCERT, APRALO, APTLD, etc. Since the launch of “.Asia”, DotAsia proactively contributes to the Asia community, supporting many charitable projects, e.g. : One-Laptop-Per-Child Asia Pacific (http://www.olpc.asia), Information Society Innovations Fund (http://www.isif.asia), Asia Pacific Regional Internet Governance Forum (http://www.aprigf.asia), Food Revolution Day initiative with Jamie Oliver (http://www.frd.asia), NetMission.Asia (youth volunteer program &network — http://www.netmission.asia), Go.Asia (http://www.go.asia), and many more.